Well, this is a huge step in the right direction for health care in the United States. Losing a loved one is never an easy process. But in Oregon, state officials are doing what they can to lessen the blow. In an effort to alleviate the suffering that so many go through at the end of their lives, the state has announced plans to provide periscopes to people who are sinking in quicksand. Being engulfed by quicksand is a terrible thing, not only for the person sinking but for their family as well. 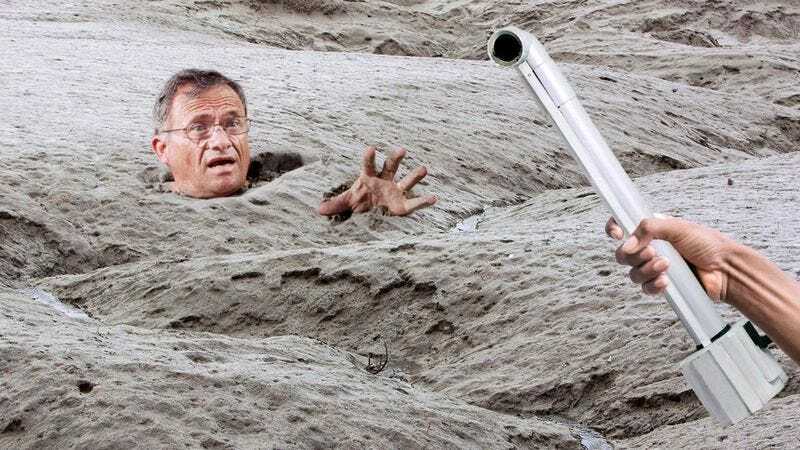 But now, thanks to this groundbreaking end-of-life-care initiative, those who are fully submerged in quicksand can hopefully find comfort in being able to swivel their periscopes around as they please during an otherwise bleak situation. Yes. Access to 360-degree panoramic views even after your head has disappeared beneath the surface of quicksand is a right all Americans deserve. With the science behind these devices only improving, it may not be long before Oregonians have access to periscopes with night-vision capabilities that could help make their final moments as pleasant as possible. Here’s hoping other states join Oregon in the fight for better end-of-life care here in the U.S., and that we may soon see periscopes sticking out of quicksand pits nationwide.